This week I will continue from last weeks post with some concepts for low power firmware design. Global and fixed address variables – Global variables can save a considerable amount of power by not passing parameters to functions (particularly for older 8-bit micros or when using external RAM). Fixed address variables can help reduce the power used when calculating addresses for structure members. If you have the good fortune of having extra RAM, using fixed address variables in functions can be much more power efficient than working with temporary variables that are addressed relative to the stack pointer. Put small functions in-line – If you have small functions that are called frequently you will save power by placing the code for those functions in-line. Particularly with older 8-bit micros, the overhead for calling and returning from a function can take dozens of clock cycles. Some compilers support using function calls in your source code to help keep the source code cleaner but will place the code for the function in-line instead of doing actual function calls. Peripheral “drivers” – If you use a micro with multiple instances of a peripheral type, say 4 UARTs for example, you can save power by having a set of code for each UART instead of generic code that is passed a parameter to specify which UART to use. This avoids the parameter passing and allows you to hardwire the peripheral register addresses in the source code instead of calculating addresses at run time. Particularly with 8-bit micros this can yield a considerable savings for frequently used peripherals. These types of functions are typically fairly small so you won’t necessarily use a lot of program space by doing this. Lean manufacturing has a concept of value added steps and non-value added steps. Value added steps directly contribute to producing the end product. Non-value added steps are essentially overhead steps that may be necessary but don’t directly contribute to producing the end product. An example of a non-value added step would be moving sub-assemblies from one section of the manufacturing floor to an assembly line. It is natural to focus on the value-added code for power optimizations because that is where the primary tasks for your product are. For the ultimate power savings, you should analyze your code to identify the non-value added sections of code that don’t get much consideration. You need to determine if the non-value added sections of code are absolutely necessary, “nice to have” or not really necessary. For the non-value added sections of code that can’t be eliminated, can they be streamlined, executed less frequently or grouped with other non-value added functions in order to save power (particularly if the micro is being taken out of a low-power state to execute the non-value added code)? Firmware loops can be very effective in reducing code size and making the source code cleaner and more readable. They can also be huge wasters of power simply because of the overhead instructions required to implement the loop. Managing the loop counter, checking for the loop termination and the jump back to the start of the loop can all be considered non-value added code. Unless you are severely constrained on code space, unrolling frequently executed loops into a repetitive series of instructions can save a considerable amount of power. This is most easily done for loops with a small, fixed number of iterations. Even loops with a variable number of iterations can be made more power efficient this way. The test for “loop” termination would need to be done between each series of instructions but the jump would only be taken once instead of each time through the actual loop. This can be a considerable power savings particularly for micros performing instruction pre-fetches that are discarded at the end of each pass through the loop. This may seem like a no-brainer but particularly with C compilers what you see in the code isn’t always what you get in execution. Pay special attention to this with variables used in loops since that one line in your source code can be executed hundreds or thousands of times. Variable size – Particularly with 8-bit micros, make sure your variable sizes aren’t larger than they need to be. 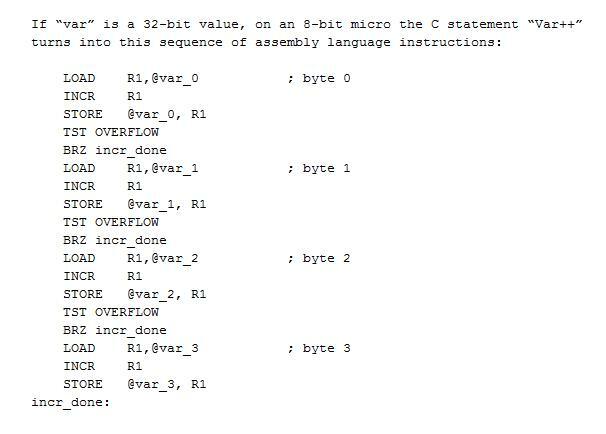 As shown in the code segment below, simply incrementing a 32-bit value can turn into 3 tests for overflow, 3 add instructions and as many as 8 memory accesses. In most cases this is just a waste of code space but if the variable is a free running counter it will be wasting power every 256th time it is incremented. A 32-bit add or compare is even worse since all four bytes of the variable must be operated on every time. Most compilers will size an “int” to be the word size of the micro but to be sure you should explicitly declare variables as int8, int16, etc. (or whatever syntax your compiler uses). Signed vs unsigned variables – Arithmetic operations on signed and unsigned values aren’t handled the same way by compilers. To avoid extra processing (and weird results from the math operations) be careful about the declarations and similar to the size, explicitly declare variables signed or unsigned and don’t assume an “int” is one or the other. Also be very careful about mixing signed and unsigned values in math operations. Variable alignment – Some 32-bit micros require 16-bit values to be on 2-byte boundaries and 32-bit values to be on 4-byte boundaries and will generate exceptions or bus faults for unaligned accesses. More sophisticated micros can handle mis-alignments and will happily turn an unaligned 32-bit access into two, three or four memory accesses without you knowing it. C compilers typically have options to allow misalignments or force certain alignments. Not so much related to power usage, compiler forced alignments can be very wasteful of RAM space by placing every variable on a 4-byte or even 8-byte address boundary. This can be particularly wasteful with large structures with various sized elements and arrays of 8 or 16-bit elements. The “pragma pack” directive can help you in this regard with structures but should be used with care since it puts you in charge of determining alignment. ASCII vs Unicode – If your product interfaces with text strings to a Windows application you may need to support 16-bit Unicode values, otherwise 8-bit ASCII should be adequate. If you are stuck with Unicode and your product requires a proprietary driver or uses a Windows app, you should be able to save power by using ASCII in the firmware and translating to Unicode in the PC based code. Next week I’ll get into the details on what you can do to make your firmware more power efficient. This entry was posted in Firmware, Uncategorized and tagged loops, structured code, variables on September 24, 2013 by Mike. We live in an era where saving energy is a topic that receives considerable attention. 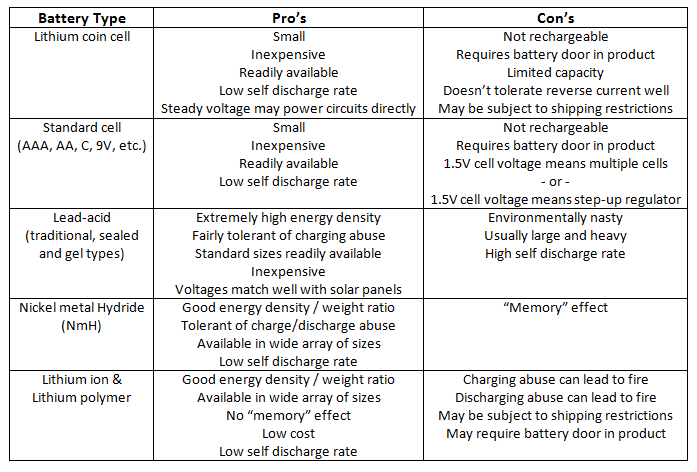 For design engineers, there are many different motivations for saving energy from your company being able to claim your newest gizmo has longer battery life than any of its competitors to conserving natural resources to reducing the air pollution and greenhouse gas emissions associated with generating electricity. Until recently, reducing energy usage in electronic circuit designs was primarily a concern for designers of battery power products. Today, legislative restrictions on energy usage are covering more and more types of products and the marketplace pressures for reducing energy usage are impacting nearly all types of electronic products from consumer electronics to IT equipment and even industrial and manufacturing equipment. In our “instant on” world where few things are ever really turned completely off, the energy a device uses when it is doing nothing is becoming more important than the energy it uses while operating. These so called phantom loads drive megawatts of electricity generation daily and are squarely in the sights of legislators writing energy efficiency regulations. There are a number of ways to reduce the energy usage of your designs. Your hardware design will establish a baseline for the minimum amount of power your product consumes but for many types of products the firmware will really determine the overall power usage. Sophisticated software power management schemes that were once mainly employed in laptop computers and cell phones are being implemented in increasingly less complex products to reduce power usage. However, simply selecting the latest low power micro and implementing sophisticated power management is the “big stick” approach to power savings. There are dozens of hardware design decisions and hundreds of firmware design decisions that will either enhance or sabotage your power saving efforts. The accumulation of these smaller savings can often save more power than the big stick savings. There are many things to consider in your designs, some will have big pay-offs in power savings but . The over-riding theme in the tips and techniques I will present is anything your design does that it doesn’t need to do is wasting energy. That sounds very obvious but many of the things we do in our designs that waste energy often are not obvious. Some of the information that will be presented can be found in other places on the Internet but newcomers to low power design may not have seen it. Many of the tips and techniques that I’ll discuss were learned through years of developing low power products. I look forward to helping with your power saving efforts. This entry was posted in Uncategorized on August 8, 2013 by Mike.